Sen. Kirsten Gillibrand (D., N.Y.) on Thursday said she would serve her entire "six-year term" if she is reelected to the Senate in November. 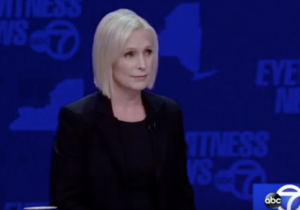 Gillibrand, who has been floated as a potential 2020 presidential nominee, responded to a question during a debate on Thursday about whether she would serve her full term. "Senator Gillibrand, you have not spent a lot of money in this reelection campaign for U.S. Senate. In fact, you have millions of dollars in your campaign coffers. Many, including your opponent, say you are saving that money to gear up for a presidential run in 2020. Can you tell New Yorkers, who plan to vote for you on November 6, that you will, if reelected, serve out your six-year Senate term?" the debate moderator asked. Gillibrand responded, "I will." She then started talking about how she has hosted 16 town halls and visited 60 counties, adding that she cares about reaching out to her constituents because wants to represent them. "Just want to make this clear, you're saying that you will not get out of the race and you will not run for president? You will serve your six years?" the moderator asked. "I will serve my six-year term," Gillibrand responded. As of Sept. 30, Gillibrand's campaign committee has well over $10 million cash on hand, according to the Center for Responsive Politics. Gillibrand's Republican opponent, Chele Farley, is trying to unseat the New York Democrat at the polls on Nov. 6. Copyright © 2018 Washington Free Beacon. All rights reserved.